Outsourcing your accounting services can have a lot of appeal for an accounting firm owner – a quick jump up to 42% profits has a lot of appeal. However it might not seem quite such a treat for your current employees on account of the words “outsourcing” and “overseas” have been linked with the notion of job loss. You want your current in-house team on board. In fact, you need them to be firing on all cylinders because making the leap to outsourcing is going to require that you and your team rethink your current work processes. That is not something you want to attempt to do all on your own (unless of course you’re a one-accountant show). You Don’t Clarify That Outsourcing Means Expansion, Not Reduction. Yes outsourcing your accounting services means a reduction in costs, but it’s a move you make when you’re looking to expand your business. You’re looking to bring in more clients, not fewer, and since outsourcing works best when your overseas workers have all of the necessary info for any one particular file, your in-house team is still going to have plenty to do. Some jobs will lose some of their responsibilities and gain others, but the business is going to grow as a whole, and there will be need of a good in-house talent pool. You Don’t Let Your In-house Talent In On Your Goals. Even if you wanted to (which you shouldn’t), making the change to outsourcing your accounting services is not something you’re going to be able to keep as a secret, not entirely at least. People fill an information vacuum on their own, and more often than not they’re going to fill it with negative assumptions. Left on their own, your people are going to speculate that the upcoming change means they’re going to be turfed, when in fact as your business grows you’re going to need them more than ever. They may go on the hunt for new jobs. Or you may find yourself with a firm full of people who are no longer on your side. All of which could be avoided if you kept them in the loop. You Don’t Let Your In-house Team Help You Make the Upgrade. 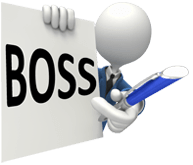 BOSS has years of experience helping accounting firms of all sizes expand their business through outsourcing. We do everything possible to make the process painless. However there is still going to be some work you’ll have to do at your end. Like we mentioned above, part of that work is redefining the roles everyone will play as your firm grows. Get your in-house team involved in the process, helping you figure out what work they’re going to be doing as your business blossoms, and which tasks each person can send to your overseas partners. Get them to help define the measuring sticks you’re going to use to keep track of how far along each account is in your new processes. Your existing talent are available to help the transition be an easy one. Use them. Make it their transition too. Give them ownership. As the business prospers, they prosper. Include your team in helping you build toward your vision of where you see your firm a year from now, and 5 years from now. Not only is a shared vision going to make everyone embrace the upgrade to outsourcing your accounting services, but they’re going to become invested in helping you achieve that vision.